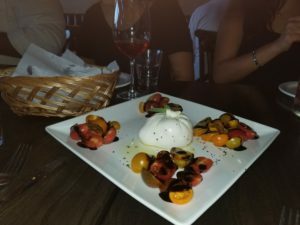 My pizza-loving husband and I were recently invited to attend a seasonal menu tasting at Plano’s popular Dough Pizzeria Napoletana. Since any season is pizza season at our house, we were eager to sample some of this fine pizzeria’s new seasonal favorites. On the tasting menu were Autumn Bruschetta, with oak roasted mushrooms, roast garlic, semi-dried tomatoes and Parmigiano Reggiano, to start things off ($9.95). The Bruschetta was followed by a delightfully fresh and original salad, featuring Bluebonnet Farms hydroponic mixed greens, arugula, pomegranate seeds, roasted butternut squash, candied walnuts, goat cheese, and Bose pear came dressed with Maple mulled cider vinaigrette ($12.95). We also sampled a delicious dish called Autumn Burrata. This house-pulled mozzarella used BelGioioso Artisan Curd and was very pretty to look at (garnering lots of photo flashes). It tasted even better than it looked. It’s filled with strands of mozzarella and cream. It was served with white honey truffle, roasted butternut squash, oak roasted mushrooms and toasted zucca seeds; they also served an Autumn Burrata plated with roasted cherry tomatoes. True cheese lovers might want to try their Mozzarella Sampler plate with Fior di Latte Burratini, Richard’s Caprese, Trufflel Burratini ($22.95). The Autumn Salad and the Burrata were so good they almost made me forget about pizza. That is until they set the first sizzling pie down on our table. The Autumn Pizza was a delightful concoction with smoked pancetta, fresh figs, goat cheese, wilted arugula, and Texas Swinney Bee mesquite honey ($17.95). Dough’s Polpette (house made meatballs, marinara, with Ciabatta bread finished with garlic rub and extra virgin olive oil) $10.95 was another well-received offering at the tasting event. 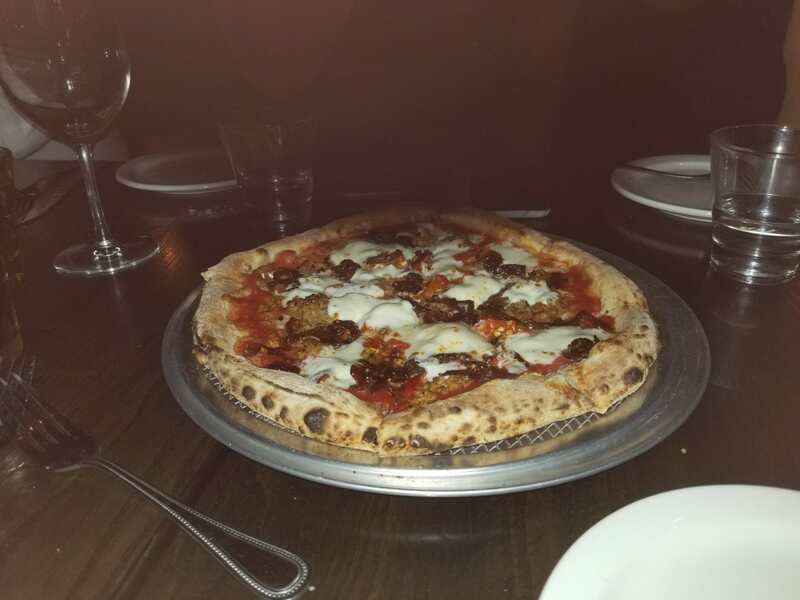 We sampled several other pizzas, including the Neighborhood Favorite “Willowbend Pizza” featured tomato sauce, Mozzarella, Calabrian chilis, housemade crumbled sausage and onions Agro Dolce ($18.95). The difference between Pizza Napoletana and other varieties of pizza include a slightly charred thin crust with sparse toppings and a raised border. Their pizzas are finished with extra virgin olive oil and Parmigiano Reggiano. Co-owners of Dough Pizzeria Napoletana are Keith Hall and Brad Liles. Liles is a former AT&T manager who left the corporate world to pursue a career in the restaurant industry. After being inspired by meeting Doug Horn at the original Dough Pizzeria in San Antonio, Hall approached him about opening one in North Texas. Brad Liles, another executive who left corporate America behind for a successful career in the restaurant industry, has previously opened eight profitable restaurants in four concepts (pizza, bakery, café and catering). 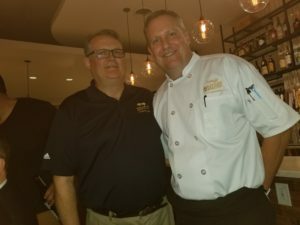 Liles and Hall have shown that the Dough Pizzeria Napoletana concept originated by Doug and Lori Horn in San Antonio is just as popular in North Texas. They have been awarded as Zagat’s top rated pizzeria in Texas the past two years. They also won a Dallas Morning News Readers poll as best pizzeria in DFW. Dough Pizzeria Napoletana is located in Willowbend Market Center, 5960 West Parker Road #286 in Plano. House are Sunday-Thursday from 11 a.m.-9 p.m.; Friday and Saturday from 11 a.m. to 10 p.m. For more information call 469-814-0269.